Hi, I am new to this site, it has some great info and tips. 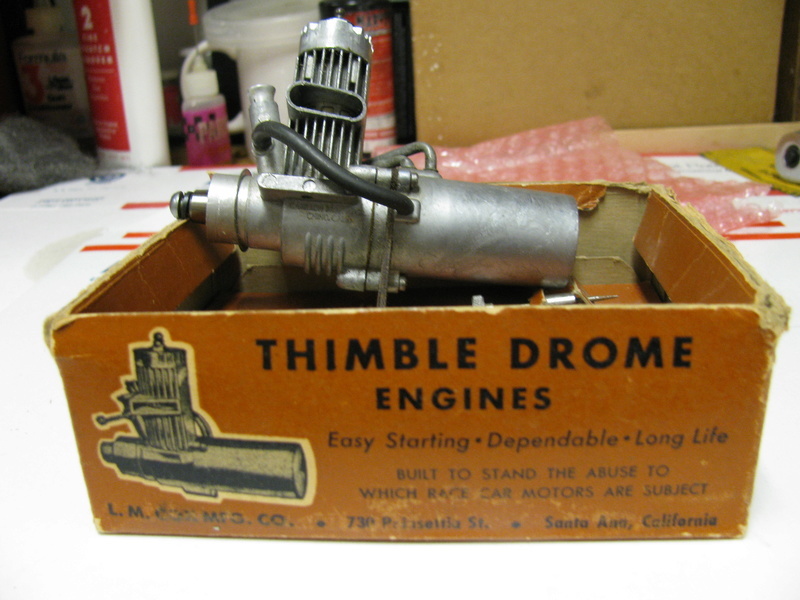 I have collected a few Thimble Drome cars, most have been original and in great shape. The latest was an attic find that my friend gave me, it was his as a kid. Car is pretty gross from sitting around and getting musty. I am disassembling it, cleaning it only and going to put it back together, not going to restore it. I cleaned the engine and it turns and pops so very cool. Question is...the fuel line has disintegrated so I am trying to find a replacement. Any ideas if I can still get one or what size it is and where to find a repop. eeyankee wrote: Hi, I am new to this site, it has some great info and tips. I have collected a few Thimble Drome cars, most have been original and in great shape. The latest was an attic find that my friend gave me, it was his as a kid. Car is pretty gross from sitting around and getting musty. I am disassembling it, cleaning it only and going to put it back together, not going to restore it. Welcome to the Dominik forum, enjoy the site! Thank you, the car is cox but the engine is a cameron, will that make any difference. Is it similar to this one? The tube was black. yes that is it exactly, black. I’ve seen the black before for sale but can’t remember where, I’ll look in my stuff next week see if I have any. The black fuel line is neoprene. Early Cox babe bees had this in the tanks. Bernie has it but it’s precut. Not sure if he has a spool of it that he could get you a longer length. Best to send him an email. I'm not quite certain as to where to source it, but I use a similar material made by Hayes. This is a black neoprene that stays on small fuel barbs and doesn't collapse when run through firewalls, grommets, etc. It's much stiffer than silicone fuel tubings and is offered in a few different diameters. crankbndr wrote: I’ve seen the black before for sale but can’t remember where, I’ll look in my stuff next week see if I have any. Thank you, I plan on using it for display only so the line was to keep it as original. If you have an extra that would be great. Thank you for the help. That may be an option, thanks. Does anyone know the size neoprene to get, I do see some out there. Thanks for the tips. eeyankee wrote: Does anyone know the size neoprene to get, I do see some out there. Thanks for the tips. Okay, the micrometer says 5/32" OD and 3/32" ID. That is on old crusty line but sounds about right. Try some of this from Tower, I can't measure this small without counting in increments of a female pubic hair, pink being finest of course.